1. Trim fat from steak; rub taco seasoning over both sides of steak. Place steak in an electric slow-cooker coated with cooking spray; add onion, vinegar and green chilies. Cover with lid; cook on low heat setting for 9 hours. 2. Remove steak from slow-cooker, reserving cooking liquid; shred steak with 2 forks. Combine steak and reserved cooking liquid; stir well. 3. Warm beans and flour tortillas according to package directions. Spread 2 tablespoons beans down the center of each tortilla. Spoon a heaping 1/3 cup steak mixture over beans. 4. Top each with 2 tablespoons cheese, 2 tablespoons tomato, and 1 tablespoon sour cream; roll up. 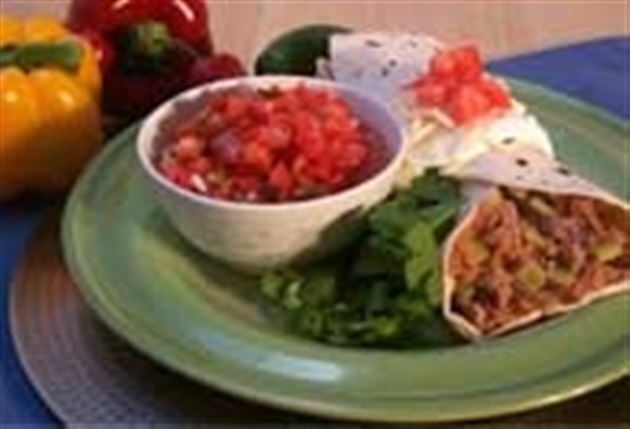 Enjoy this delicious burritos Mexican recipe!